Professor Linda Doyle with PJ Murphy, Joycean enthusiast. 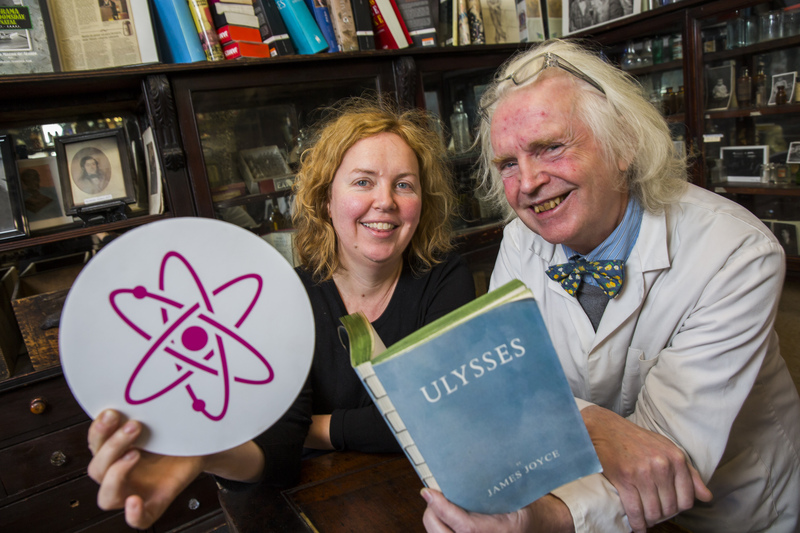 As part of the Centre’s programme of events for Science Week 2016, CONNECT partnered with Sweny’s in Dublin city centre for a public reading of scientifically-themed passages from Joyce’s Ulysses and Finnegans Wake. Sweny’s is a landmark of Joycean Dublin and is remembered as the spot where Leopold Bloom purchased his bar of yellow soap. “Though not scientifically trained himself, there are some interesting scientific references in the work of Joyce,” according to Joycean enthusiast PJ Murphy. “His mentions of Einstein’s research are the most obvious. At today’s reading we are paying particular attention to the word ‘quark’ which appears in Finnegans Wake. This was selected by the Nobel Prize winning physicist Murray Gell-Mann as the name for the newly discovered elementary particle.